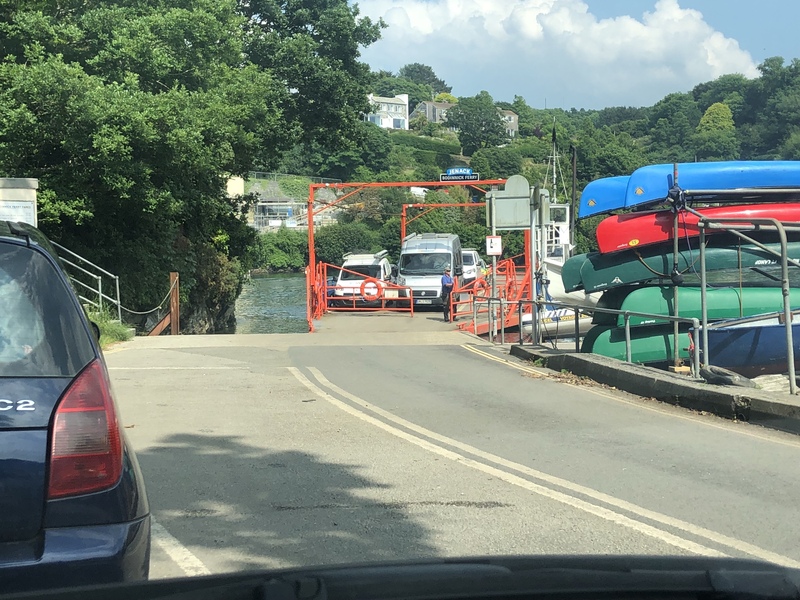 Day Two of our holiday and the sun was shining – I wasn’t sure what was worth seeing locally so we took a chance and drove to Fowey, a fishing village on the coast. The car park was at the top of the town and it was a twenty-minute walk downhill into the village. The view from the car park is stunning and as you descend into the winding streets of the village it’s a real treat. 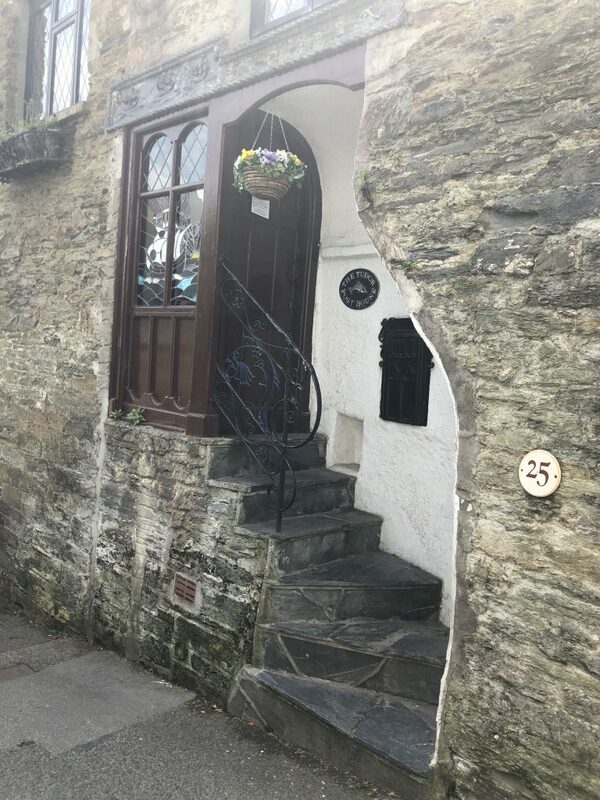 It was apparent quite early on that Fowey is one of the most dog friendly places I’ve ever been. 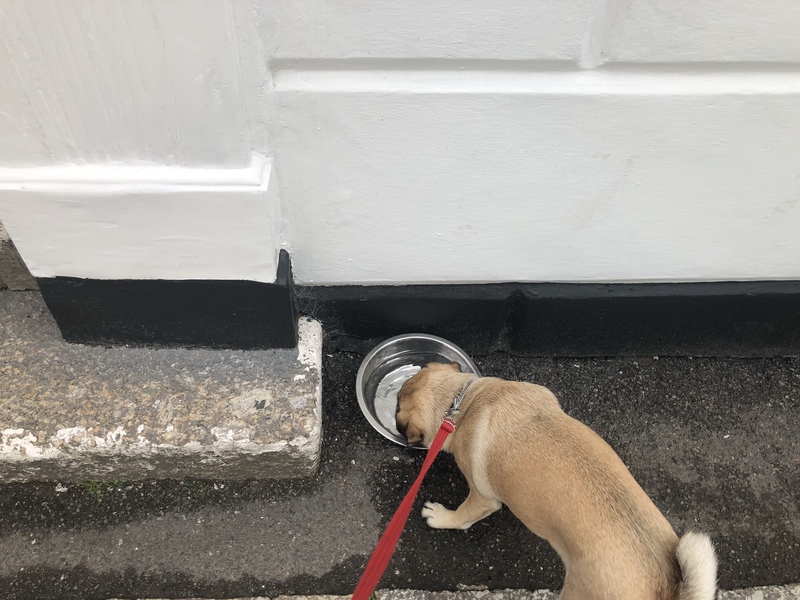 The car park had a dog bowl and water and most shops and places of interest had bowls of water and biscuits for the furry ones. 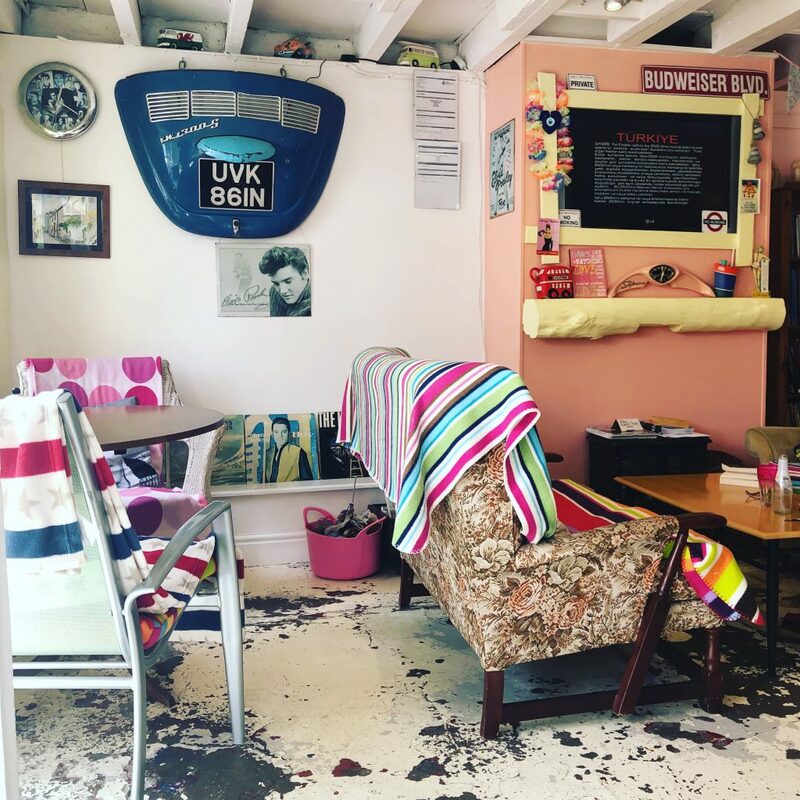 After a wander around we spotted Pinky Murphys, a quirky little café that was dog friendly and looked like a nice spot for lunch. Inside it’s decked out in an array of quirky quotes and signs and it even had a TV playing cartoons for the kids. We could also take the dog inside and the tables had little wooden games on to entertain little ones(and husbands) while waiting for food and drink to arrive. 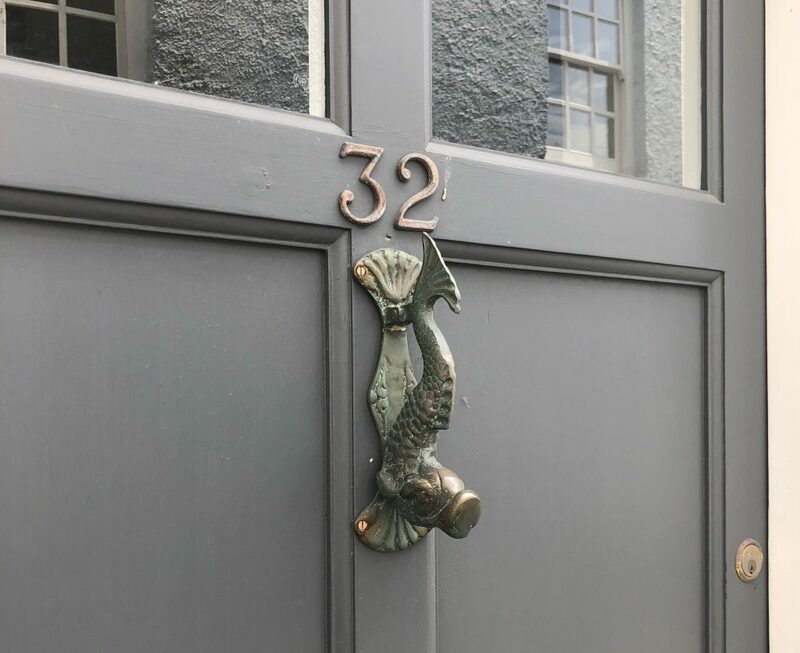 The staff were lovely and could not have done more to make us feel welcome and comfortable. 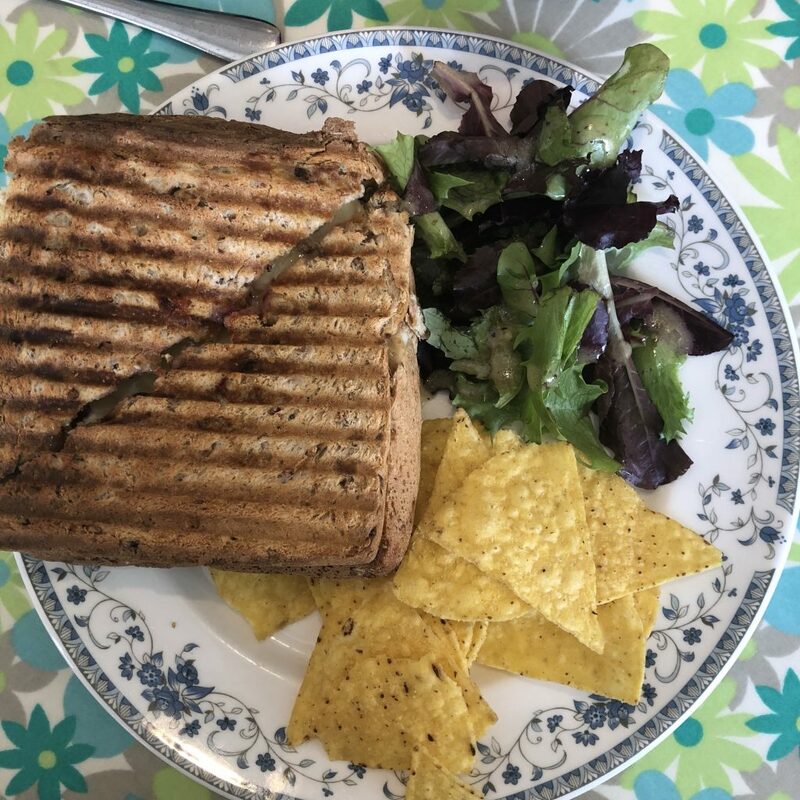 The menu had so many veggie options too – a true hidden gem and a must-visit for anyone. After lunch we wandered down to the town square and came across Vincent Foye(AKA John), a cartoon artist and possibly one of the nicest people I’ve ever met. 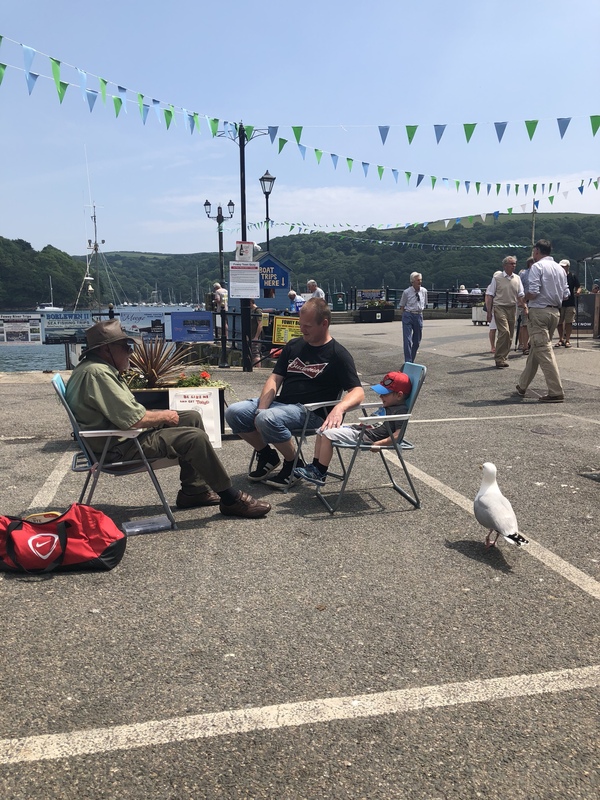 For £5 he drew the dog and the boy – but was so entertaining with his stories of quacking ducks, pirates and all sorts of things. He took his time and the boy was completely enthralled by his stories. You’ll find him most days in the town square – well worth a look. 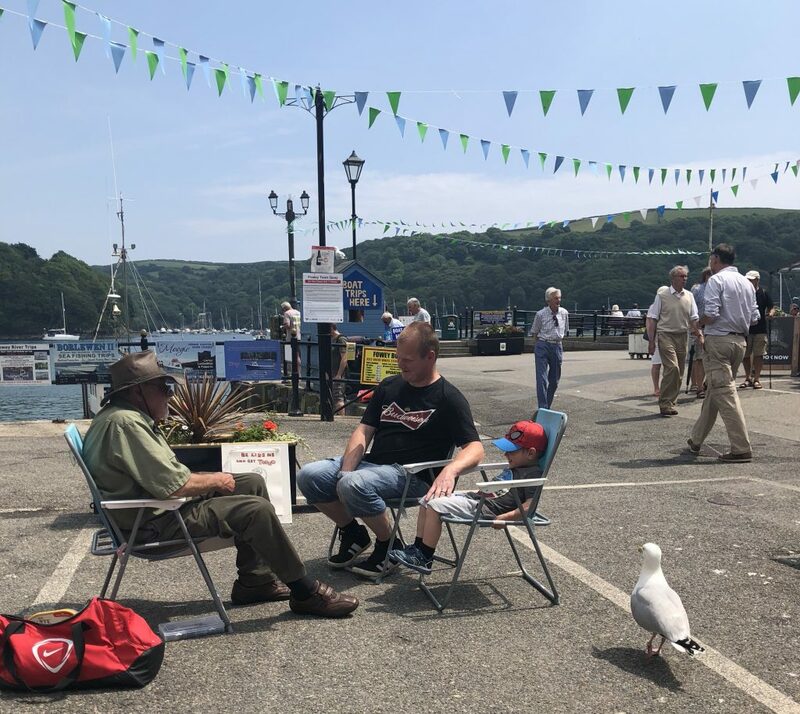 We were having one of those days that will be forever etched in your mind as amazing and next we decided to hire a self drive boat – you just wait near the steps at the square and it’s £25 for 30 minutes or £30 for an hour(!). You can take dogs and after a quick lesson we were off, motoring around the estuary exploring. And it was amazing – a lovely way to spend an hour indeed. 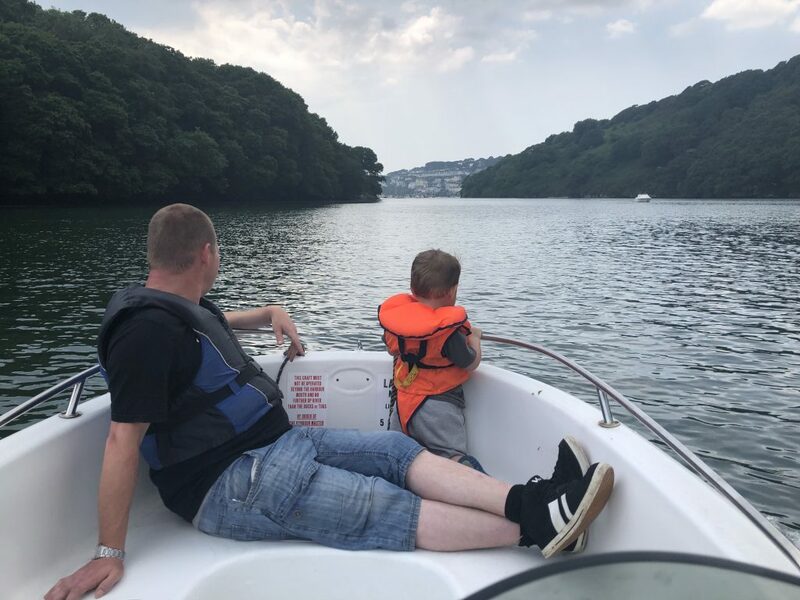 We all had a go at driving the boat, including the little dude – he discovered early on that spinning round and round was the best thing ever and he was hysterical with laughter. 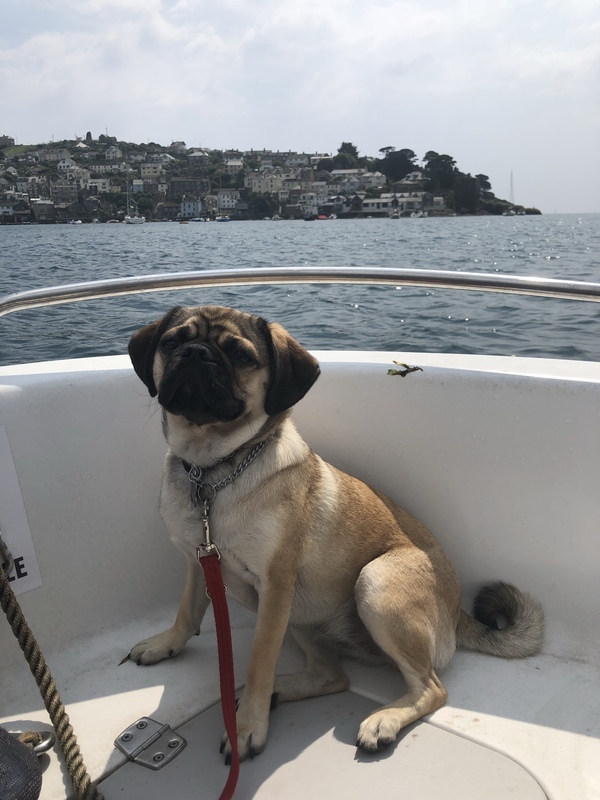 Tip – a lead with buckles like this Halti one is ideal – we attached the lead to a handle in the middle of the boat so she could roam freely yet safely! 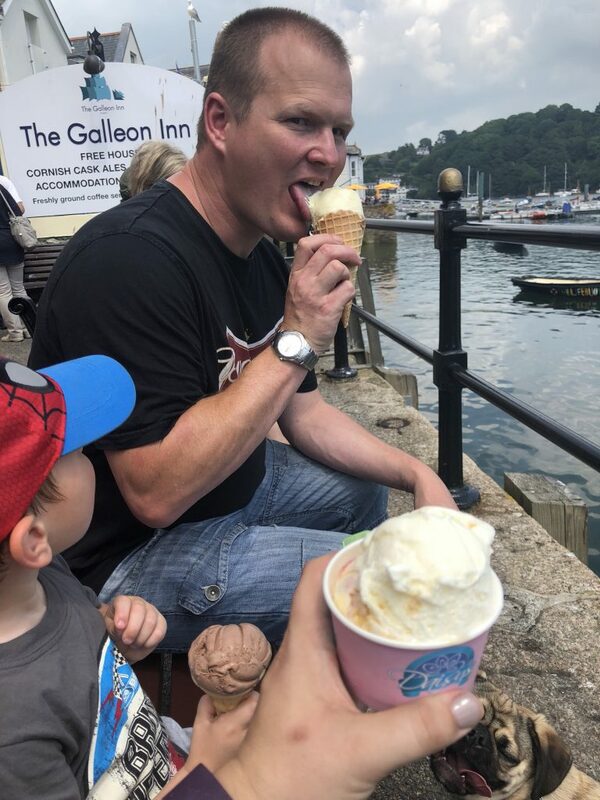 We couldn’t have left without an ice cream – I forget the name but it’s a pink ice cream parlour next to the aquarium. It was yummy! …was a bloody killer! It was hot and it’s steep – there is a shuttle bus that runs from the square for a few quid, I wish we’d done that as I was done in by the time we got back to the car! 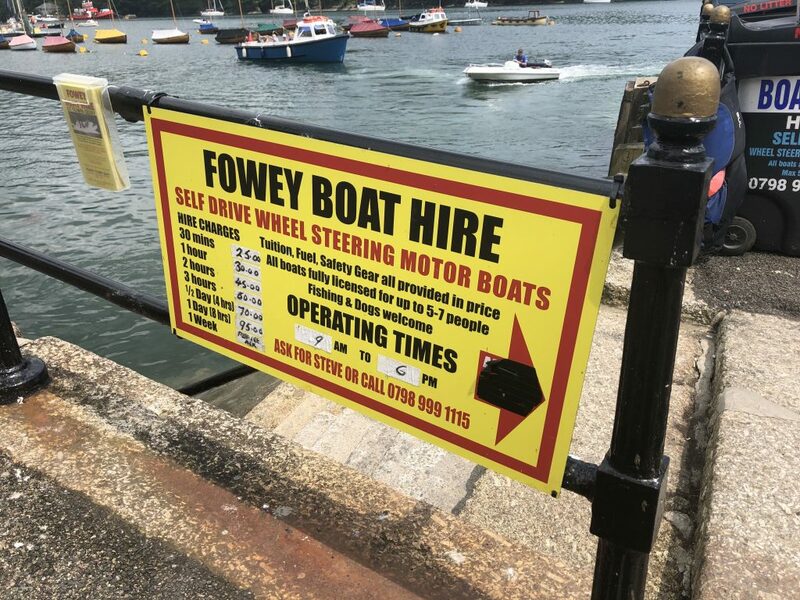 We were staying near Looe – to drive to Fowey it takes about 45 minutes and means driving up to the A390(the blue arrows) and it can be a bit long-winded. 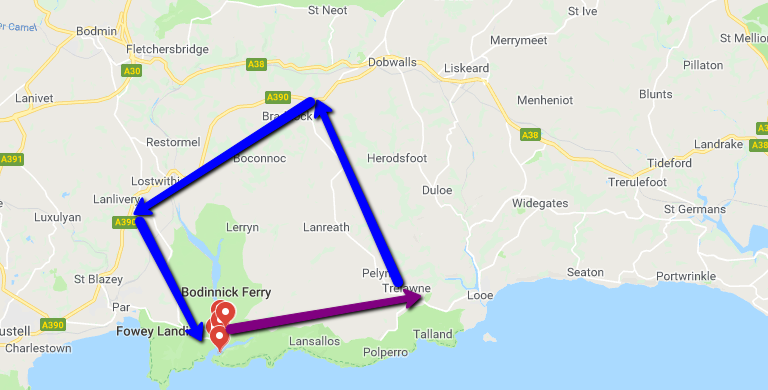 We decided on the way back to take the Bodinnick Ferry, which shortened the journey(purple arrow) and looked like good fun. It cost £5 per car and cut out a lot of traffic. We spent six hours exploring Fowey – it was one of the best days we’ve ever had and is a must-see for anyone visiting the area. 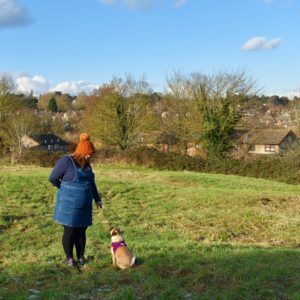 Especially families and people with dogs – it’s one of, if not the most family and dog friendly places I’ve ever been. We can’t wait to return!